This year’s high river flows deposited sediment and scoured new ground surfaces for a variety of native and non-native plants to grow. So what is growing along the Boise River? Thanks to wetland expert Chris Murphy from the Idaho Department of Fish and Game, joined by botanist Dr. Roger Rosentreter and riparian ecologist Dr. Rob Tiedemann, BREN members got an up-close look at numerous seedlings, saplings, herbs and grasses. Black cottonwood (Populus trichocarpa) seedlings were growing in abundance along newly deposited sediment. Cottonwood seedlings are identifiable by their red stems and serrated leaves. Unfortunately, most of these seedlings will not survive because the river flows were drawn down too rapidly, lowering the water table below their rooting zone. How can you tell between a cottonwood sucker and a sapling grown from a seed? Look at the base of the plant. The sucker will be thicker along the base where it has emerged from the root system of a mature cottonwood tree. Suckers are genetically identical to the parent tree, whereas cottonwood seedlings provide genetic diversity. Black cottonwoods are considered a keystone species in the Boise River system, as many wildlife species rely on cottonwood for critical habitat. For an in-depth discussion on black cottonwood and river flows, please refer to Dr. Tiedemann’s blog on the subject. As a seedling, false indigo (Amorpha fruticosa L.) looks kind of like black cottonwood – but don’t be fooled! False indigo seedlings are distinguishable by rounder, non-serrated leaves that grow opposite from each other. Unlike the cottonwood seedlings, false indigo is tolerant of drier soils. So if you see it, pull it! False indigo has become invasive along the Boise River, easily outcompeting most native woody shrub species. A tribute to their robust rood systems, these mature false indigo plants survived through weeks of inundation and force from the river. Another look-alike, Wood’s rose (Rosa woodsii) kind of looks like false indigo but notice the shorter, serrated leaves and of course, the thorns. Wood’s rose is an important native shrub species. We saw numerous silver maple and catalpa seedlings. Both are non-native, so does that make them “bad”? On one hand, they take up space where native trees, such as the cottonwood, could otherwise grow. But on the other hand, they provide important habitat and are better suited for reproduction in the regulated Boise River system. Are there any trees that should be removed? Scientists are not all in agreement, but our experts list tamarisk (Tamarix spp. ), tree-of-heaven (Ailanthus altissima) and Russian olive (Elaeagnus angustifolia) as the worst offenders, as they alter the surrounding environment to their own benefit and at the expense of natives, provide marginal habitat for wildlife, and are largely left alone by insects. In short, they don’t participate in the ecosystem. Numerous weedy plants have quickly established themselves on the newly formed and cleared surfaces, such as pigweed (Amaranthus retroflexus), pinappleweed (Matricaria discoidea), jointed goatgrass (Aegilops cylindrica) and quackgrass (Elymus repens). 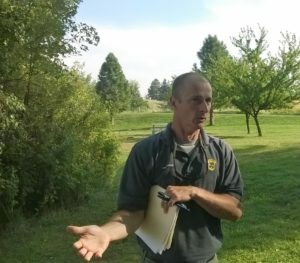 So what’s growing along the Boise River? A lot of the same plants, including invasives, that were established along the river before the high water. The best thing riverfront homeowners and volunteer groups can do to help natives plants thrive is to remove noxious and invasive species. Learn more about the importance of native riparian habitat in the Boise River Enhancement Plan. If you’re interested in learning more, consider becoming a Weed Warrior! 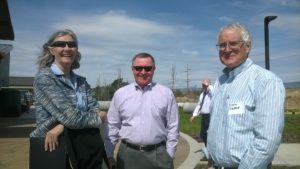 We have great news for the Boise River – the Boise River Enhancement Network has been awarded $100,000 by the U.S. Bureau of Reclamation to implement Phase II of the WaterSMART Cooperative Watershed Management Program! The grant was submitted and supported with the following partners: Ted Trueblood Chapter of Trout Unlimited, City of Boise, The Land Trust of the Treasure Valley, Intermountain Bird Observatory, Idaho Department of Fish and Game, Boise Valley Fly Fishers, and the Ada County Highway District. Project funds will be used to restore the natural function of the last 440 feet of Cottonwood Creek where it enters the Boise River in Julia Davis Park in downtown Boise. Cottonwood Creek is currently buried in a flume starting where it enters the city, and ending in a concrete and stone outlet that dumps into the Boise River. Once ‘daylighted,’ Cottonwood Creek will provide an array of ecological, educational and aesthetic benefits. The Boise River Enhancement Plan recommends daylighting tributaries to improve habitat complexity and geomorphic function of the river. The project will provide new instream fish habitat to support spawning, rearing, and over-wintering, all of which are limiting to the Boise River fishery. Native whitefish, native sculpin, and naturally spawning rainbow and brown trout will benefit from this project. Completion of this project will also create 0.35 acres of riparian and wetland habitat providing new habitat for native wildlife and improving water quality through the capture, filter and removal of pollutants. Daylighting Cottonwood Creek has been in the master plan for the park as well as in the City of Boise’s master plan for more than 15 years. Funds will be used in the first year to update and revise the 2003 project plan developed by the Ted Trueblood Chapter of Trout Unlimited and in the second year to construct the channel and review performance. The estimated completion date is September 30, 2019. The project includes a robust engagement, education and outreach component with many opportunities for volunteers to participate (see timeline below). Stay tuned! Activities and milestones for the Cottonwood Creek Daylighting project. Oct – Dec 2017 1) Formalize partnerships with cooperators: City of Boise (both Boise Parks and Recreation and Public Works), Boise State University, US Forest Service, Idaho Department of Fish and Game, Army Corps of Engineers, Ada County Highway District, and Idaho Department of Water Resources. 2) Create Community Engagement Workplan that describes the kinds of community engagement and volunteers (professional, manual labor, skilled, etc.) needed, when needed, and who is responsible for recruitment including a calendar of planned community engagement opportunities (e.g open house, willow planting). The plan will also establish quantifiable goals for engagement. 3) Create a Community Engagement database and use it to track community engagement and volunteer activity. 4) Create a Public Relations Workplan that includes dates for press releases, media tours, public events, blogs, presentations, videos, project updates, describes the social media strategy, and assigns responsibilities. Goals for number of people reached will be established. 5) Create a Knowledge Transfer workplan that includes tasks and a timeline to ensure that knowledge of the project, including design, permitting, partnership creation, construction, community engagement and monitoring, is transferred to other stakeholders in the watershed to support Boise River enhancement. Goals for the number of stakeholders reached in Ada and in Canyon counties will be established. 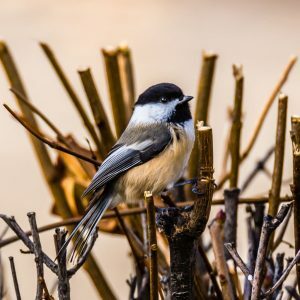 6) Create a plant palate and planting plan: The Land Trust will work with the Intermountain Bird Observatory and local restoration and water quality experts to create the planting palate desired and a site plan to guide the planting effort. 7) Cottonwood seedlings will be grown from seed collected nearby which will help get a jump start on the enhancement effort. Volunteer effort will begin. 8) Additional plant material will be grown by the Land Trust and its partners over the course of the project, building an inventory for enhancement for this specific project. Jan. – June 2018 1) Update technical design and develop work plan and monitoring plan of daylighting project. 2) Provide opportunities for public input on design. 3) Seeds will be collected and riparian shrub cuttings will be prepared for planting. April 2018 Develop RFPs for Contractors: clearing & grubbing; asphalt removal; irrigation demo, temporary supply, final repair; excavation of channel; plants; turf replacement; concrete & asphalt; park elements. July 2018 1) Promote the daylighting project in local media and with target audiences. 2) Secure balance of implementation funds needed. Sept 2018 1) Community Engagement Report that tracks numbers of volunteers, jobs accomplished, hours volunteered and basic demographic data. 2) Communication/Education Annual Report that describes public relations and knowledge transfer activities and results. 2) Community Engagement Report that tracks numbers of volunteers, jobs accomplished, hours volunteered and basic demographic data. 3) Communication/Education Annual Report that describes public relations and knowledge transfer activities and results. This year, 2017, the big news regarding the Boise River is the high flow. And while that’s challenging news for some homeowners and we who recreate on the Greenbelt; there’s good news too. The most desirable trees along the Greenbelt are the native Cottonwoods and Willows; both can withstand the flooding. In fact, flooding and a bare seedbed is just what Cottonwoods need for regeneration. This regeneration has been missing on the Boise River where flows are now controlled by dams and reservoirs. It’s also good news because some noxious and obnoxious weeds may be set back or killed by prolonged inundation. An example, the Russian Olive is an invasive tree that has been reported to be controlled by flooding. We shall see since there are hundreds of small Russian Olive trees in Marianne Williams Park and they are under water. 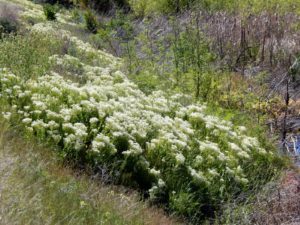 One noxious weed that may be controlled is Whitetop (also known as Hoary Cress), now in flower along the Greenbelt. Noxious weeds are non-native invasive plants declared as noxious by the government because of their potential economic damage. Whitetop displaces native plant species and reduces biodiversity, wildlife habitat and forage production. It is poisonous to cattle. Herbicides are only marginally effective on Whitetop; also, the roots go down many feet making pulling ineffective on established plants. According to a Montana University Report, flooding can be a useful method for controlling Whitetop. Apparently successful flooding to control Whitetop requires continuous submersion from May until September in most cases. In our case, some of our whitetop will be flooded from March through June or longer. We can hope it works, but the bare ground that will be left behind will be an open invitation to seeds of both desirable and undesirable plants. 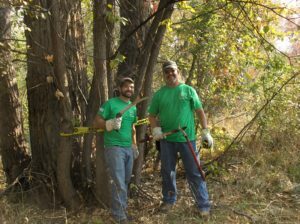 Citizen volunteers can play an important role in controlling invasive plants along the Boise River. While volunteers are limited in the controlling weeds on public land along the Greenbelt because we’re prohibited from using chainsaws or applying herbicides, we can help control some weeds by pulling or severing the taproot and preventing them from going to seed. If the seeds are short lived in the soil, it should be possible to control some weeds in just a few years. Poison Hemlock, Houndstongue, and Spotted Knapweed are three examples of noxious weeds found on the Greenbelt whose seeds survive for only about 3 years. Other plants, including trees, can be controlled as seedlings, and plants like biennial thistles can easily be controlled by severing the taproot prior to blooming. With a little knowledge of how to ID these plants and a knowledge of their growth characteristics, we should be able to make a significant difference in areas that have small populations of plants. Control of Russian Olive and other established trees can be facilitated by public and private landowners by cutting the trees using chainsaws and immediately painting the stump with an appropriate herbicide. 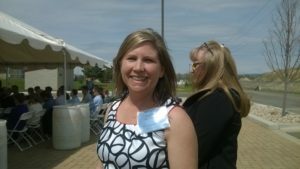 Martha Brabec, Restoration Specialist for the City of Boise, is working on a plan to prioritize remediation efforts and provide information on plant identification and control methods. She’s starting a program like Montgomery County’s Weed Warrior program. Participants will train on weed ID and removal with her in the field and in the classroom, and then are “certified” to complete tasks on their own. Weed warriors will log hours, weeds removed and locations using an on-line form, and will have monthly or bi-monthly group projects. I’d love to see you at the upcoming orientation. Editor’s Note: Implementation of a comprehensive invasive and non-native weed control program is recommended in the Boise River Enhancement Plan. 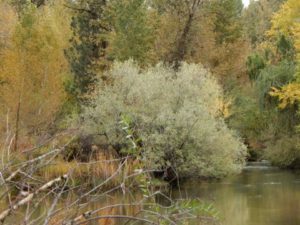 The cottonwood forest along the Boise River was historically vast and had an understory comprised of willow, alder, birch and rose; this has been compromised by a mix of non-native and invasive species, including false indigo (Amorpha fruticosa), several grasses, (e.g. reed canarygrass [Phalaris arundinacea]), poison hemlock (Conium maculatum), purple loosestrife (Lythrum salicaria), and various deciduous trees. These species out-compete native plants and decrease the function and value of wetland and riparian habitat. The Boise River Enhancement Plan identifies the removal and management of these species as a priority action. By any objective measure employed by peer reviewed science – including species diversity, number of habitat types, and community structure – rivers and their forested floodplains provide greater quantity and quality of wildlife habitat as compared to reservoirs. This is intuitive to most of us who recreate in the outdoors and interact with anglers, hunters, and naturalists. Periodic flood flows are needed to maintain the health of riparian habitat. Among other public benefits, flood flows: (a) recharge the shallow groundwater aquifer which later releases water to down river wetlands, (b) sweep the channel free of debris and maintain the conveyance capacity of the river, (c) control noxious weeds by physical disturbance and prolonged inundation, and (d) establish a seedbed for black cottonwood, the dominant native tree species of the region. Cottonwoods are intolerant of shade and require flood flow events to provide fresh alluvium within the channel, and scour of the adjacent floodplain to remove competing species that may shade young seedlings. In unregulated rivers, this commonly happens only one in ten years, leading to the establishments of cohorts of cottonwoods in large, same age stands. 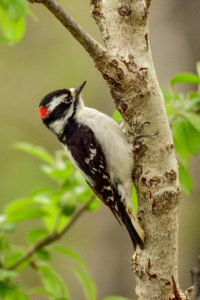 The resulting mosaic of blocks of cottonwoods of different sizes – seedlings, whips, immature, and mature trees – contributes to the diversity of habitat for wildlife, especially birds which include bald eagle, osprey, great blue heron, black capped chickadee and other song birds. 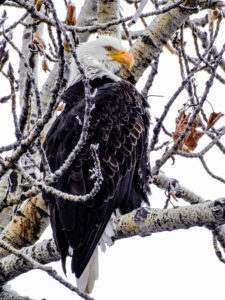 The cottonwood forest is also essential for its contribution to the base of the food web, and is the principal source of nourishment for the aquatic ecosystem. Each fall, the massive amount of leaf litter that falls to the ground flushes to the river and provides the carbon needed to fuel the ecosystem. No other species contributes an equivalent amount of energy to feed the community of aquatic insects, that feed the fishes making the river their home. Lastly, the cottonwood forest lessens the impacts of urbanization by shading the river and moderating water temperatures to make the river habitable for cold water species like rainbow trout. And, it sequesters nutrients, like phosphorous, which has been documented in the scientific literature to cause nuisance blooms of algae in the Lower Boise River. The profits to the public resulting from the remaining free flowing portions of the Boise River and its tributaries are observable, measurable, and have been demonstrated repeatedly. These three criteria are the foundation of science and distinguish it from speculation, casual observation, or self-serving interest. Public policy will determine future management of the Boise River. I value that which is based on information with origins in science. It’s a good way to do business. The moment of truth for the development of Ada County since 1955 has arrived. For more than 27 days, the flood-swollen Boise River has rolled through Boise, Garden City and Eagle at 8,000 cubic feet per second with only minimal damage and inconvenience. Today it flows at 8,600 cfs as measured at Glenwood Bridge and federal dam managers say they may have to raise the flows again. We have come to this point because those before us made a series of decisions that allowed Boise to become a thriving urban center with the Boise River at its heart. Lucky Peak was built primarily for flood control and when it was completed in 1955 it gave the U.S. Army Corps of Engineers the chance to regulate spring runoff. This provided Boise the opportunity to build in the flood plain, but such development remained a risky investment for developers. By the 1960s, Boise residents were beginning to see their river in a different light — no longer simply a channel for irrigation waters and a sewer to carry away human and animal wastes and the effluent from processing plants on its banks. 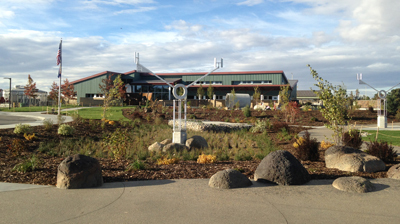 The City of Boise hosted a great party on April 12 to officially open the Boise WaterShed River Campus, a winning combination of public art and interactive environmental education. The Boise River Enhancement Network congratulates the many dedicated staff, artists, volunteers, elected and appointed officials at City of Boise and Boise WaterShed Exhibits Inc. on a job well done. The Boise WaterShed has the largest collection of public art in Idaho. Artist Matt Grover. His metal sculpture is a graph of water flow in the Boise River. Like raindrops dropping one by one on pavement, gathering together and gaining momentum as they flow to the river, the creative ideas of artists, engineers, educators, landscapers and exhibit designers flow together to form a confluence on the new River Campus at the Boise WaterShed Environmental Education Center. 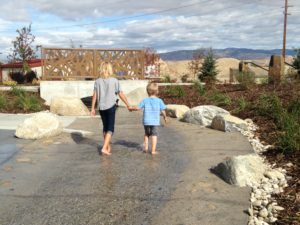 A public grand opening is scheduled for Saturday, April 15 from 10:00-1:00 – join us to see the “new” WaterShed and the largest collection of Public Art in the State of Idaho. The 2-acre living display and the renovated interior exhibit hall transform the messages of conservation and protection in an experiential way. However, it’s how the story is told that makes this a unique cultural destination. Through the interpretation of artists, and the lens of science, we tell the story of our watershed through public art in the River Campus. Visitors will experience water cascading from the headwaters, flowing into Lucky Peak Reservoir. 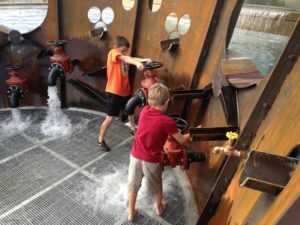 They can manage the water flowing from Lucky Peak Dam and stroll past the City of Trees, through a facsimile of the water renewal facility, then follow the flow of the river, past wildlife, agricultural areas, and a wetland. Visitors will have a better understanding of how their actions upstream impact the water availability and water quality downstream. Families and young visitors will enjoy the sewer pipe play area and learn the importance of a healthy ecosystem with nature play in the interactive trail. More than 179,000 people have experienced the Boise WaterShed’s programs since 2008. The renovated exhibit hall and upgraded exhibits now welcome them back and invite new experiences for young and old. BREN’s Boise River Enhancement Plan recognizes the critical role of education facilities and programs in engaging the public in the important work of taking care of the Boise River. Congratulations to City of Boise and the Boise WaterShed Exhibits Inc. for investing in the future of our river and our community. swim across to the other bank. I shudder at the thought. Luckily, I don’t have to be in the river; but what about the fish? How do they survive this roiling rollercoaster? Aren’t they just swept away during high flows? Where do they go in high water? The short answer is simple: floodplains. 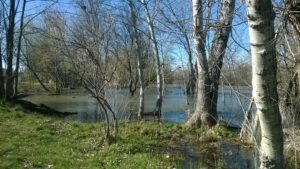 As Tamsen Binggeli mentioned in her March 6, 2017 blog, floodplains provide many benefits including flood moderation, water quality improvement, recreation and habitat diversity. (Reference 1) For this discussion, floodplains include smaller side channels, sloughs, wetlands, beaver ponds and other areas of inundation beyond the river’s main channel. Fish typically escape a river’s fast flood flows in floodplains. They usually spread out and find refuge in slower moving water as the river spreads out. (Reference 2) This preserves a fish’s metabolic energy and promotes fish growth. Juvenile fish also use floodplains as nurseries as they develop and grow. Generally speaking, the quality of a floodplain’s habitat is directly proportional to its diversity. This is because different fish species, life stages and food sources utilize different types of habitat. Diversity in aquatic and riparian habitat supports species diversity and health. Variations in water depth, water velocity, substrate composition, in-stream wood and rock formations and streamside vegetative cover all play important roles in habitat diversity and quality. A 2008 study out by the University of California, Davis (Reference 3) underscores just how important floodplains are in the development of Salmonids. (Fish belonging to the taxonomic family of Salmonidae, which includes salmon, trout, char and whitefish.) 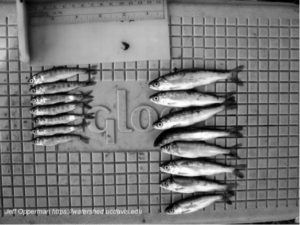 In this study, juvenile Chinook salmon were placed in two different types of enclosures when the wild salmon would naturally be rearing in floodplain habitats in and along the Cosumnes River in California. One group of enclosure represented the open, faster water associated with the river, whereas the second group of enclosure was placed on the river’s inundated floodplain. Overall, the study concluded that the juvenile fish realized higher growth rates and lower mortality in the floodplain habitat when compared to those in the river habitat. The photo shows the juvenile salmon from these two study groups; the larger ones being the fish reared in the floodplain enclosure. Of course, a healthy, diverse floodplain must exist to support a healthy fishery. The floodplain must also be hydraulically connected to the river and not cut off by levees, roads, culverts and other barriers. Currently, the Boise River possesses these attributes only marginally as its tributaries, side channels, wetlands and other floodplain features have been sacrificed to land development over time. As development continues along the Boise River corridor, we must employ measures that protect, preserve and enhance the river’s floodplains to maintain the river’s native fishery and all the other benefits the river and its floodplains provide. BREN’s Boise River Enhancement Plan recommends removing or setting back confining elements like levees and re-establishing or creating side channel habitat to improve aquatic habitat. And for your safety – take a lesson from the fish – stay out of the river’s fast flowing flood water! Mike Homza is a long-time resident of Boise; President of Stream Line Design, LLC; Vice Chair of BREN and focuses his career on a enhancing rivers, stream and their floodplains. Listen to the 25-minute show. 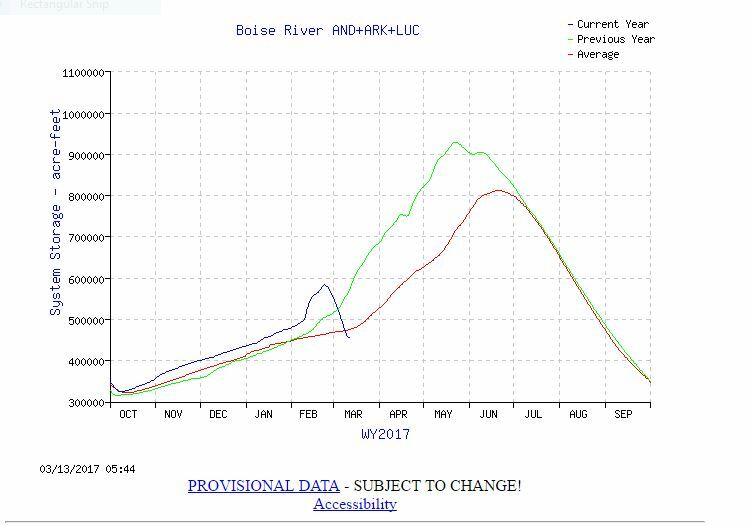 Good news, as of March 11, 2017, according to data provided by the NRCS SNOTEL sites, the Boise basin snow-water equivalent moved up 7 percentage points since earlier in the week to 152% of normal. 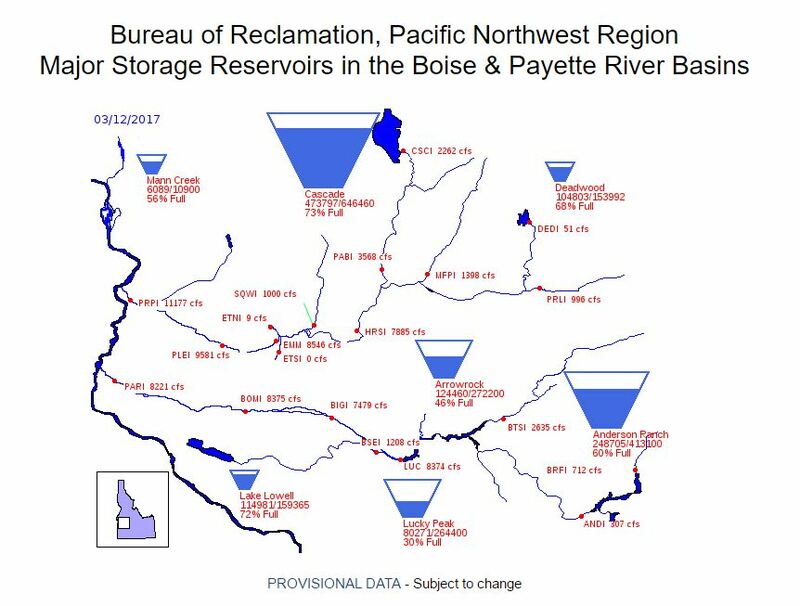 You can see in the Boise System Storage graph below, that as of March 10, 2017, the pesky blue line (current reservoir storage) finally pierced the red line (30-year historic average of reservoir storage). The relatively early and significant flood risk reduction releases this year unloaded another 55 thousand acre feet (kac-ft) out of the upstream reservoirs, leaving nearly 500 kac-ft of storage available in reservoir capacity (48%). Meanwhile, the NRCS’s March 1 Streamflow Forecast is calling for nearly 2,500 kac-ft of runoff out of the Boise River in March-July (range 2,140 – 2,750), where the 30-yr average is 1,430. The underlying message is that we’re going to need to run approximately 2,500 kac-ft through a 500 kac-ft bag in the next few months. That’ll be more than we’re accustomed to seeing. Now that the recent rain has dogged off and the sun has come out, inflow into the system bumped up from 2,400 cfs to 6,816 cfs. Increased inflow will add just a wee bit more pressure on our reservoir bag. 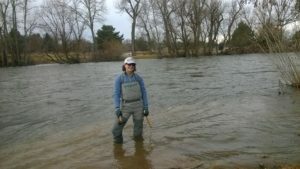 Last week flows on the Boise River, as measured at Glenwood Bridge, eased into the official National Weather Service “Flood Stage,” when the 7,000 cfs marker was crossed on Tuesday, March 7. Since crossing the official threshold, flows have been steadily increasing to the 7,500 cfs range we’re seeing today. The last time we saw flows this high was in May of 2012 when the river peaked at 8,310 cfs. Water managers continued moving water into Lake Lowell through the New York Canal. Last week, Lake Lowell increased 7.5 kac-ft. If the irrigators weren’t taking that water, that’d be an additional ~1,000 cfs through town. The next time you bump into an irrigator on the street or in the field, you might just offer a heart-felt “Thanks!” for what they’re doing to reduce flood risks. Click here for more from Steve Sweet.